Two years ago, former Annan Academy pupil Emma Jayne Park was diagnosed with Hodgkins Lymphoma and vowed she would never make a drama out of her experience. After persuasion by a colleague and a subsequent commission, however, the 32-year-old Gretna-born dancer and theatre maker says “It’s Not Over Yet” and is ready to tell her story in an energetic performance she hopes will change the way people relate to both dance as an artform and cancer sufferers. Emma said: “Initially, when I got poorly, I said I would never make a show about having cancer. I don’t believe in social tourism but rather think we should applaud everyone who has the disease. I also didn’t want my experience to make me create bad art, so I held off. “Going through the recovery process made me realise there were a lot of things sitting with me that I wasn’t comfortable with and I developed strong opinions about the way people communicate with cancer sufferers. Using movement and text, the piece will share part of Emma’s life only those closest to her witnessed: a journey of remembering, evaluating life choices and exploring why they matter. The piece forms part of the Scottish Mental Health Arts Festival, to which Emma is Associate Artist. The Dumfries performance is one of only two taking place in Scotland. Supported by Dumfries & Galloway Arts Live’s Support for Ambition programme, It’s Not Over Yet takes place at The Stove, Dumfries, on Saturday, 28 October, at 7.30pm. The performance will be followed by a post-show discussion where audience members can speak to Emma about both the work, her practice and growing the dance sector in Dumfries and Galloway. Based in Edinburgh, Emma trained in dance in Scotland and New York before landing her first job with an opera at the Edinburgh International Festival. Realising Scotland had a lack of repertory work for dancers, she began her own company, Cultured Mongrel, and her passion for dance as a communication channel means she now spends most of her time living out of a suitcase and touring the country. Emma is a strong advocate for development of dance and is heading-up the pilot of a Young Dancers Development Programme and dance touring network for Dumfries and Galloway in 2018, supported by the Holywood Trust. During her recovery, Emma spent many months indoors, unable to perform or go out to shows. Thinking about people in her situation, she came up with the idea of free living room performances. Emma has teamed up with musician, composer and sound designer Nik Paget-Tomlinson to deliver a free performance to anyone who is house-bound for medical reasons and wants to enjoy a performance from their own living room at a time between Sunday, 29 and Monday, 30 October. The maximum audience capacity is five and performances will be 25 minutes long followed by a short question and answer session with the artists. She explained: “Living room performances are the first stage in developing quality theatre work that can be reshaped into intimate home-based performances considering the specific needs of people who are house-bound for medical reasons. 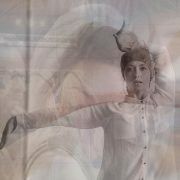 There will also be an opportunity for musicians, dancers and performers to explore generating movement and sound from everyday objects with Emma and Nik on Saturday, 28 October, from 2pm to 4pm, at the Stove, Dumfries. The workshop will explore rhythm, text and syncopation while also finding new ways to generate performance material as a musician, a dancer and collaborator. The workshop will be inspired by themes from It’s Not Over Yet. Tickets to It’s Not Over Yet performance and the workshop are available from the Midsteeple Box Office, Dumfries, or from www.dgartslive.org.uk. Further information about Emma’s work may be found at www.culturedmongreldance.com.